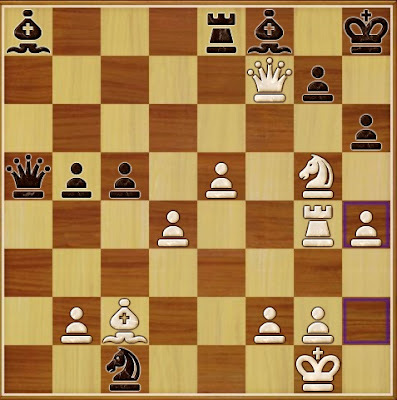 A pawn sacrifice, common in Bishop's Opening, the objective of which is to consolidate White's center. White could take the d pawn immediately, but he has other things in mind. A subtle move. This neat Bishop gambit forces White to open the e-file. Black tries to drive away White's Queen, but Black is unperturbed. If 16.... Qc7 then 17. Qh5! with great attacking possibilities. The Rook is poisoned. If 18....Bxe4, 19. Bxe4 followed by 20. Bxh7 and 21. Ng5 with good attacking prospects. Black offers his Knight in return, to lure White's c2 Bishop away from action. White's attacking prospects are greater than the value of captured material. Here, White has a two-pronged attack. The move takes the Rook away from harm, and defends the Knight from Black's Queen. If 23. Qg6, then Black equalizes with Qxg5. Now, if 23....hxg5, then 22. Qh5+ Kg8, 23. Bh7+ Kh8, 24. Bg6+ Kg8, 25. Qh7 mate. Black creates a diversion on the Queen side of the board. Whites creates an escape square for his King. Having no other good move, Black resigns. White's Queen cannot be prevented from going to g6 and h7. At this point, if 24.....hxg5, then 25. Qh5+ Kg8, 26. Bh7+ Kh8, 27. Bg6+ Kg8, 28. Qh7 mate. 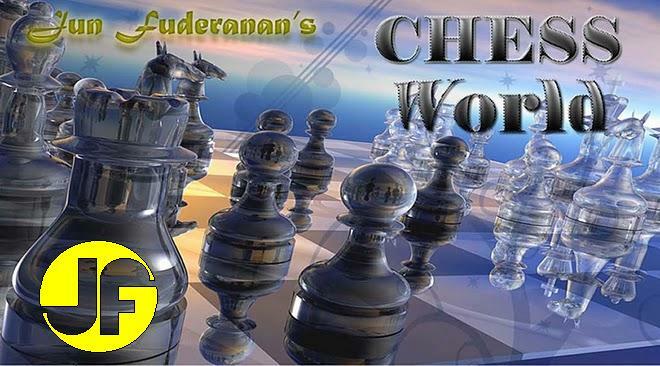 A superb play by Viswanathan Anand! 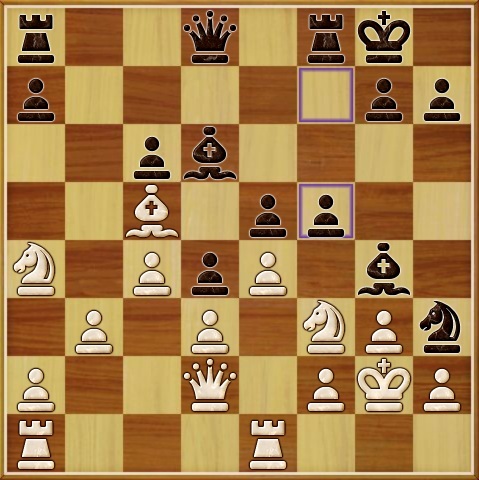 Undeterred by a double-pawn, Black develops his pieces. 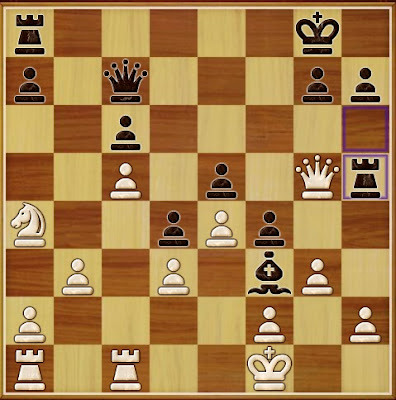 Black should have moved 8. .... Bd6 right away. 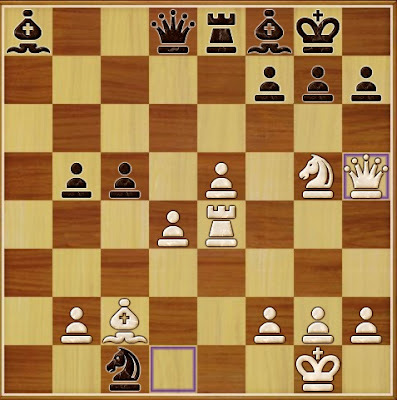 Black has to block the advance of White's e-pawn. A dubious move. 14. h3 makes more sense. Black threatens Ng5 winning the Knight. White cannot take the pawn. Doing so would put tremendous pressure on the f-file. If 17. Nxe5 Bxe5, 18. Bxf8 Ng5! Black plays aggressively. White's King intends to run to the queen side. The Queen is "mated", so White resigns. While 25.....Rxh2 is also good, the text nails down the Queen immediately.